What’s The Department Of Homeland Security Hiding? The Department of Homeland Security knows something about the hack into the Democratic Party’s servers, but in response to a Freedom of Information Act request, the agency turned over just two pages of unclassified information — and blacked out almost all of those. But we’ve decoded the details that they left public. US intelligence suspects that Russia hacked computers last summer at the Democratic Congressional Campaign Committee (DCCC), the fundraising arm for House Democrats. But intelligence officials have yet to offer definitive proof to support their allegations. So BuzzFeed News tried to pry loose documents from one agency that looked into the hack: the Department of Homeland Security’s Office of Intelligence and Analysis (I&A). What the agency turned over to us and Ryan Shapiro, a PhD candidate at MIT and a research affiliate at Harvard University, is truly bizarre: a two-page intelligence assessment of the incident, dated Aug. 22, 2016, that contains information DHS culled from the internet. It’s all unclassified — yet DHS covered nearly everything in wide swaths of black ink. Why? Not because it would threaten national security, but because it would reveal the methods DHS uses to gather intelligence, methods that may amount to little more than using Google. What’s troubling about shrouding these unclassified documents in such secrecy is that US officials continue to leak details about Russia’s influence in the presidential election while fiercely resisting attempts to pry loose documentary evidence that would give the public a firm sense of what the government actually knows. 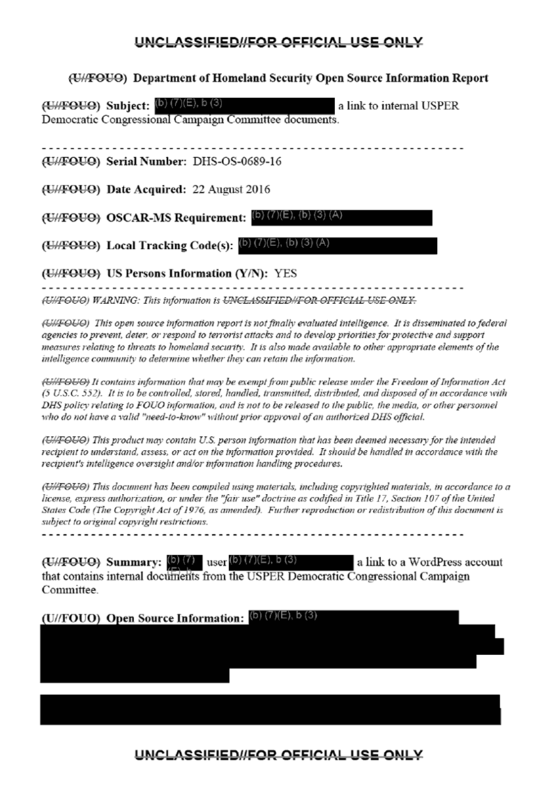 Still, from the few tidbits DHS left intact on the document, we can decipher some of what’s behind the redactions. This two-page document is only a fraction of the documents about the hack that DHS possesses. The agency identified about 29 pages of records. The agency withheld seven pages in full and referred 20 to a different, unidentified government agency that will review those pages and determine whether any of them can be released. Stay tuned. Please send tips and information to jason.leopold@buzzfeed.com. If you’d like to send your tip securely and anonymously, go to tips.buzzfeed.com.